Today we had a lazy day. We had a sleep-in till 9 o’clock, what a luxury. We switched on the heater in the bathroom again and I was slightly disappointed to see the gray colour on the walls was still not turning white. 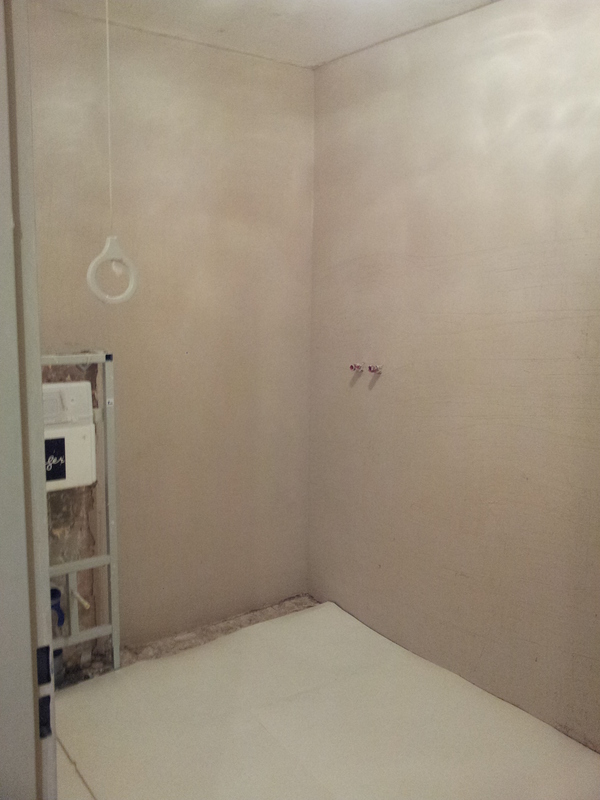 This means it’s still damp and if the plaster is not dry on Monday, Koen will not start on the tiling. As it was a rather nippy day, we decided to not open all the windows upstairs but open the attic window instead. There will still be a bit of a airflow going up so the damp air will disappear alright. On top of that, due to the windows being closed the temperature will be a bit higher what in my opinion would also be beneficial for the drying of the walls. Now at the end of the day I do see white patches appear what gives me hope for coming Monday. It will still be another day of drying, fingers crossed. As said, we had a lazy day. Due to the fact we were absolutely knackered last night, we skipped the shoppings and today we went at an earlier time than normal. Well, that was not that good an idea as the shop was full with people. On top of that, the shop had changed its layout and nobody was capable of finding their shoppings easily. Everybody was wandering around to find all the bits and pieces they overlooked when walking past them first time. With our shopping list we managed to do the shopping in one trip. As we normally do all the lanes by going up and down zigzagging, we came across everything we needed first time and didn’t need to go back to find overlooked items. We were home within about half an hour after leaving the house. Ok, I have to admit that the shop is not even 5 minutes walking away from our house. I did plan to do some gardening today but due to the cooler weather we skipped this idea and just sagged out on the settee watching Star Trek Voyager instead. The minutes I’m outside during a smoke break I’ve used to pop in a row of seeds in the coldframe of carrots and radishes. In the veggieplot, they are already growing. 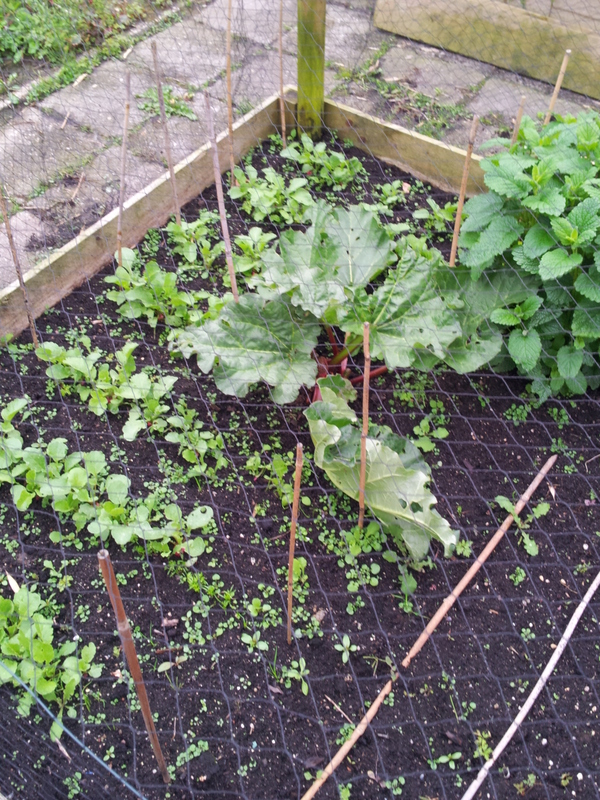 The radishes there are almost fit for harvesting, I will give them a few more days though. The cold frame by now contains a few cucumbers, gherkins and pepper plants. As there is still space enough for a few more plants these rows will not take too much place and it’s also handy to germinate seeds for later crops. In the veggieplot I did sow some rows of red beets and there are little dots showing with growth. The spring onions are showing above the dirt as little spiky grasses and the carrots even show their characteristic fernlike leaves. Two leaves of the rhubarb have gone flat over the rows of carrots/onions and I think I can forget about a proper harvest on those areas. I’ve filled most of my hanging baskets with the begonias I’ve prepotted in the attic and in one I’ve potted the mini petunias. It had its first tiny little flower yesterday and I was so proud over that. The strawberry are doing very well and it looks like they’re close to flowering by now. In the meantime in the attic I still have a lot of little plant to go outside when the weather is perking up a bit more. 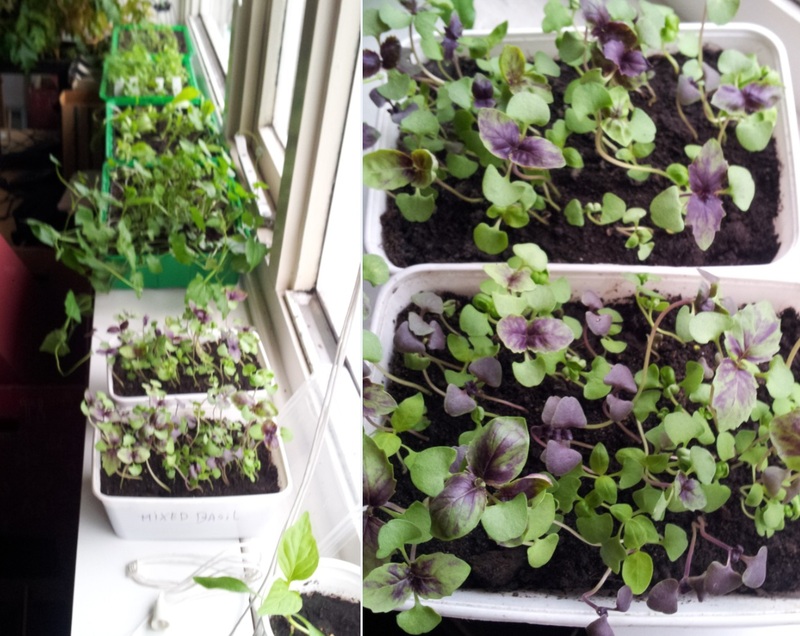 I’m especially proud of my mixed basil plants which are really growing very well. One tub will be for the kitchen window and the other one is going in the garden to see if I can get this one to grow even bigger. The house itself at the moment has got dust everywhere (on top of the previous dust). My keyboard which is originally black does have a grayish tint now due to yesterdays plastering. In the cupboard and on the piano it all feels a bit gritty. I assume I do have to run around with a duster later to get the most to vanish. We’ve had our first bigger wash up in the kitchen sink this morning. I can tell you it’s not nice to have to wash yourself like that. How on earth did they do this when showers/baths were not common indoors? The sink is too high to properly wash your hair (I had to stand on tiptoes to be able to get my head under the tap) and while soaping yourself it’s dripping all over the floor and the front of the cupboards. On top of that, while soaping you also cool down rather quickly making it a frigging chilly happening. I will be soooo glad when we do have a proper shower again. Just book me in for a few hours by then. This entry was posted in What's happening and tagged bathroom, flowers, garden, piano, plants, vegetable. Bookmark the permalink.